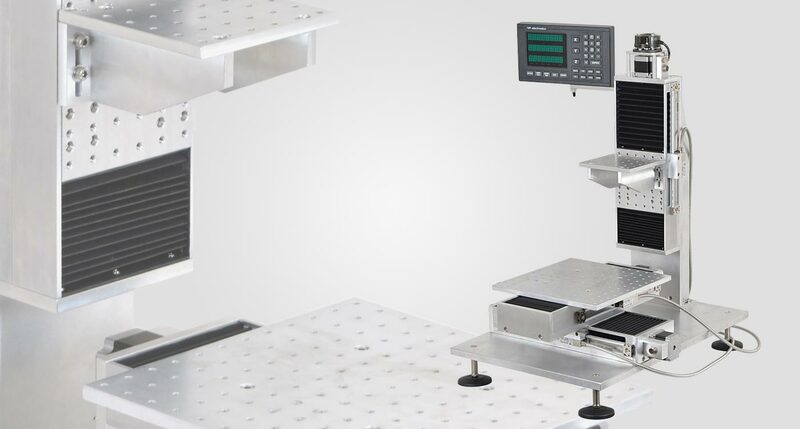 All the three linear stages are stepper motor controlled and have precision rolling contact bearings to ensure straight-line accuracy and repeatability in measurements. These stages are fitted with optical encoder having 1 micron resolution. Travel for X, Y and Z stages are 250 mm. Optical head or scanning units can be fitted to the Z stage using suitable angle brackets. Vertical measurements can be taken by repeated focusing at the points of interest. Digital read outs with 1 micron resolution is fitted to the vertical column at ergonomical eye sight location. The read outs have large LED display and various programmable features like error compensation, calibration, etc.. We can also stack XYZ stage according to customer’s request. It is connected with our motion controller unit and can be controlled by computer software via RS232 interface.